The award by Sinoma of several orders for Nigeria and Senegal to companies of the AUMUND Group has consolidated AUMUND’s position on the African continent. Working closely with Sinoma Nanjing NDI, AUMUND Beijing will supply more than a dozen machines to countries in Africa by 2020. Another of the AUMUND Group companies, SCHADE Lagertechnik, won the order to supply several machines for two Dangote projects in Nigeria. For each of the two 6,000 tpd plants, Dangote Obajana Line 5 and Okpella, AUMUND will supply three Belt Bucket Elevators with a capacity of 660 tph to convey raw meal, and to feed raw meal to the preheater towers at 520 tph. Three further AUMUND Belt Bucket Elevators with a capacity of 480 tph will convey cement to the silos. An AUMUND Pan Conveyor with a weighing scale mechanism and a capacity of 500 tph, running from the coolers to the clinker silos, and three further AUMUND Pan Conveyors under the clinker silo, round off this comprehensive machinery package. SCHADE also won orders for these plants, a Stacker with a capacity of 3,500 tph for Obajana and another at 2,160 tph for Okpella, as well as a Portal Reclaimer to operate at 800 tph in the limestone storage of each plant. Additional stockyard equipment completes the supply package. For each of the Dangote projects Apapa and Onne Clinker Export & Gypsum Import Terminal, AUMUND Beijing will supply a Double Bucket Elevator to convey clinker to the silos at a capacity of 1,200 tph, and several other Chain Bucket Elevators. Those to convey gypsum to the bunkers will have a capacity of 720 tph at Apapa and 480 tph at Onne. Two 1600 Series Samson® Material Feeders with a handling capacity of 400 tph of clinker, two AUMUND Telescopic Chutes and two Truck Loaders for clinker will also be supplied to each terminal. As a further outcome of the successful working relationship with Sinoma, AUMUND has received an order to supply a Belt Bucket Elevator with a capacity of 300 tph to convey cement to the new silo at the Dangote Cement Senegal Expansion Project. AUMUND has partnered with Sinoma over the past 20 years to supply numerous key conveying technology components for Dangote projects all over Africa, among others for Ibese lines 1-4 and Obajana lines 3-5 in Nigeria. AUMUND Belt Bucket Elevators to convey raw meal to silos and preheater towers, Pan Conveyors to convey clinker from coolers to silos and for silo discharge under the coolers, are some of the major AUMUND products to be found in these cement plants. 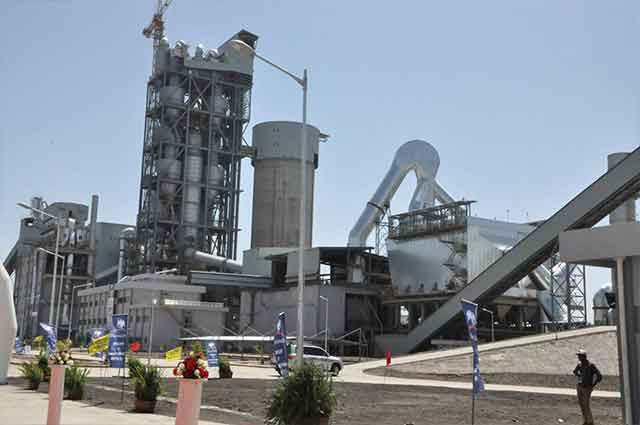 Dangote Cement prides itself on being the leading cement producer in Africa, with plants in ten countries on the continent, with a total production capacity of 45.6 million tonnes and more than 24,000 employees. The Obajana, Ibese and Gboko plants alone produce around 30 million tonnes of cement per year.